UPDATE: I've now updated this post and added the above "Printable Guide" button so you can print out the guide to take with you on the road! I removed the pictures and reformatted a little bit to shrink the size down to 6 printed pages. I hope this makes it easier on you in case you don't want to use a cell phone or tablet the whole time. 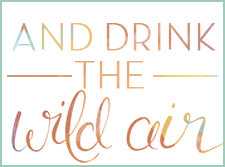 Just click the button to take you to the print page! 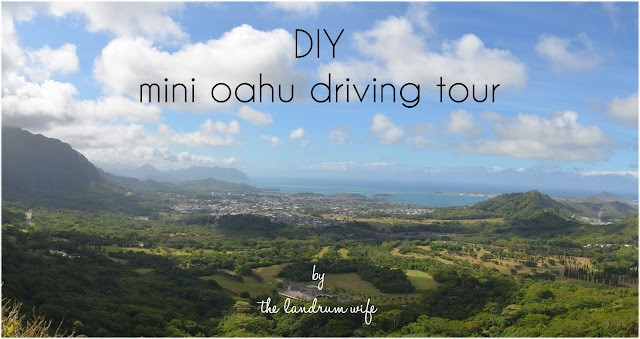 In my last driving tour post, I covered a popular route that involves driving all around the island of Oahu (minus the leeward side) and taking up the better portion of your day. But if you're interested in doing a driving tour but don't have a full day to commit to exploration, what do you do? Well, I'll tell you -- you go on a mini road trip! This route begins exactly the same way as the original driving tour, but takes a different turn when you get to the windward side of the island. Because it begins the same way, my advice still applies regarding time to leave and when you'll probably get hungry, so be sure to visit the original driving tour post to check out the additional tips before you get on the road. Click on the map above to open Google Maps and see the route interactively -- the stops below are listed alphabetically, skipping the starting point A, to match the stops on the map. NOTE: Some of the destinations marked may be approximate locations instead of exact, so follow the directions written out below to be 100% sure. 1. Leave A, your point of departure (in our case, near Hickam AFB/Pearl Harbor). NOTE: You can easily make Waikiki Beach a stop -- just plan for parking ahead of time or just park at the Honolulu Zoo since it’ll be earlier in the morning and therefore less crowded. We were going to spend another day in downtown and Waikiki, so we opted to skip it on this day and just catch of glimpse of all of the upscale shops and the beautiful beach. 3. Take Diamond Head Rd as it turns into Kahala Ave, then turn left onto Kealaolu Ave. Drive a little more slowly through here to check out some of the island's more expensive houses! 4. Merge onto Hwy 72 (Kalanianaole Hwy/H-1 East). Continue past where H-1 ends and stays just Hwy 72. Keep following until coming up to Maunalua Beach Park, which will be on your right at the red light at Hwy 72 and Hawaii Kai Drive. There is a large paved parking lot and a small, rather unimpressive beach (it's actually a boat launch), but the views are very pretty. 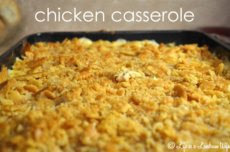 It isn't a completely necessary stop though, so skip if you're so inclined. This picture was taken from a picnic area about a tenth of a mile from the end of the parking lot (and probably isn't an actual part of this beach park, but close enough!). Plan to stay about 5 to 10 minutes for photo ops. 5. Drive out of the parking lot (or picnic area if you went a little farther up) and take a right back out onto Hwy 72 (Kalanianaole Hwy). Drive approximately 1 mile until you reach a red light intersection with Lunalilo Home Rd. Turn right onto Lunalilo Home, drive about 0.2 miles, and then take a left onto Poipu Dr. From there, drive 0.7 miles and then take a left onto Lumahai St. Then drive to the end of Lumahai St and park along the side of the street near a yellow sign that says 119A (this marks the passageway to the next stop) just before the cul-de-sac. 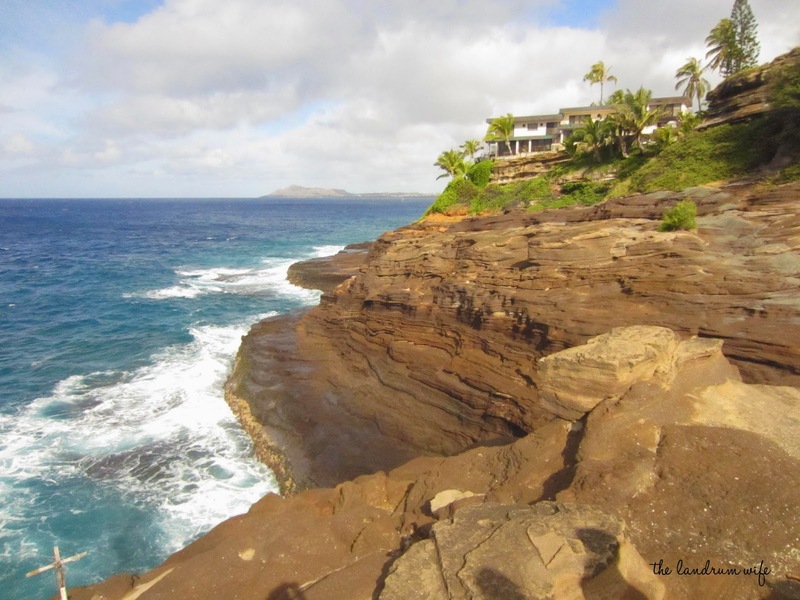 The Spitting Caves is a cliffside spot tucked away in a residential neighborhood on the far side of Hanauma Bay. The waves crash violently here and at one spot into a cave, but sometimes they're calm enough for some risk-taking cliff divers to jump into the waters below. Please note that the pathway down to the cliffs is a bit steep, so be careful if you're in flip-flops. It's also pretty windy! Plan to spend about 10-15 minutes here. WARNING: If you choose to jump from this spot or anywhere else, you do so AT YOUR OWN RISK. Spitting Caves has had two tragic deaths in the past few months (both young Navy sailors) because of jumping into rough ocean waters. Please be WARNED and be KNOWLEDGEABLE of the risks of this kind of activity before participating and STAY SAFE. If the ocean looks rough and/or you aren't a strong swimmer, DO NOT JUMP AT ALL. 6. Go back the way you came on Lumahai St. and make a right back onto Poipu Dr. From there, drive about 0.5 miles and turn right onto Nawiiliwili St. Then take Nawiliwili St. until it ends and turn right back onto Kalanianaole Hwy. Drive for approximately 0.2 miles until you come across a tiny lookout on the left side of the road with the impressive Koko Head behind it. Turn left into the lot and park. Beautiful pull out on the side of the road that overlooks Hawaii Kai, its marina, the blue-green water, and the backside of Diamond Head (on the far left of the picture). Limited parking, but it rotates quickly after people have taken their pictures. Plan to stay 5 to 10 minutes for photo ops. 7. Pull back out onto Kam Hwy by taking a left. Drive literally only 0.1 miles before making a right at the sign that says "Hanauma Bay Nature Preserve." NOTE: Make sure you're not going on a Tuesday or else the park will be closed, and try to get to this stop before about 9AM. The parking lot loves to get full around this time! 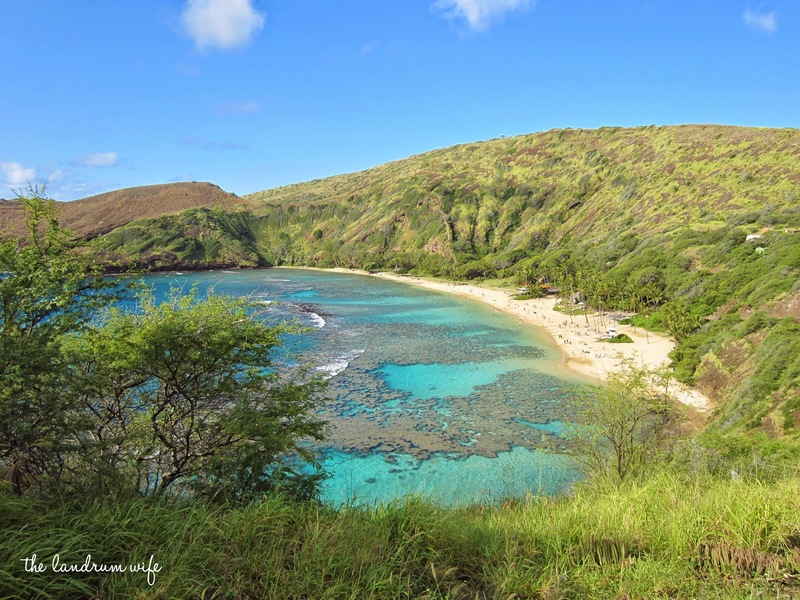 If you're looking to visit here later and want more information, check out my post on visiting Hanauma Bay. 8. Exit the Hanauma Bay parking lot and turn right onto Hwy 72. Drive for about 1 mile until you see a "Scenic Point" sign on the right hand side of the road. Pull into the parking lot. The first pull out after you pass Hanauma Bay and start the rocky coast portion of your drive. It's not completely necessary, but it's always nice to soak in your first moments of seeing this gorgeous coastline. Plus, if you're a LOST fan, you'll recognize that some scenes were filmed here! Plan to spend about 5 to 10 minutes here for photo ops. WARNING: Please don't hop the barriers to get closer to the edge of the rock walls -- it's obviously hazardous to you staying alive. 9. Pull out of the parking lot and get back on Hwy 72, taking a right. Stay on Hwy 72 until you come upon a parking lot on the right side of the road with a small beach close by, approximately 0.7 miles. Pull in and park. 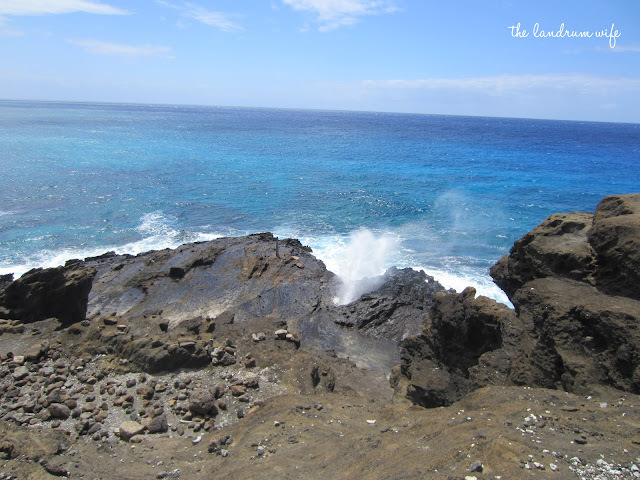 The Halona Blowhole is one of the more well-known sights on the island. Waves can push the water as high as 30 feet into the air during the wintertime through the blowhole, making for a pretty spectacular sight. Plan to spend about 10 to 15 minutes or so here waiting for that perfect bit of spray and checking out the beach mentioned below from the parking lot. WARNING: Again, just like Lanai Lookout, don't go past the barriers and climb down the rocks to the blowhole. It's reckless, dangerous, and people have died here. Don't be like them. 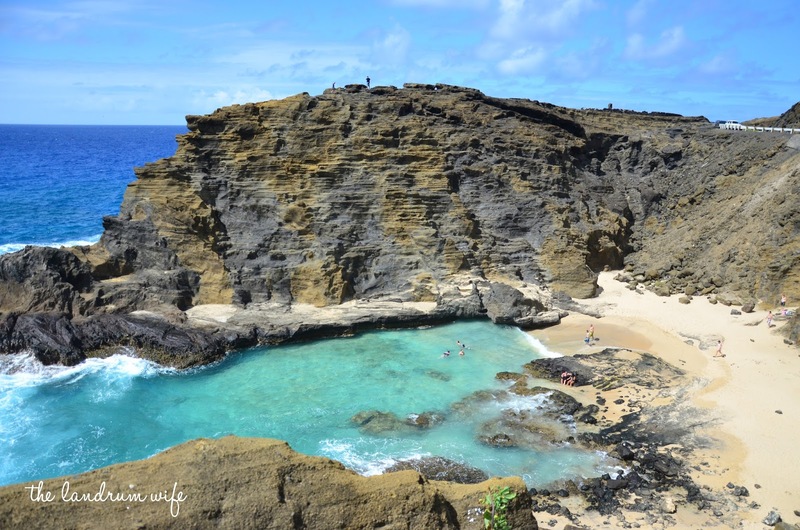 "Eternity Beach", or Halona Beach Cove, is another spot on Oahu made famous by Hollywood. If you've ever seen From Here to Eternity, you'll recognize it as the location of the beach scene. You are able to see this beach from the parking lot of the Halona Blowhole, and there is a pathway down to it closer to the road. If you climb down, you'll probably want to spend a little bit of time there, so I'd suggest coming back on another day if you really want to check it out. 10. Pull back out onto Hwy 72, taking another right. The road will break a bit from the coastline and travel a little more inland. 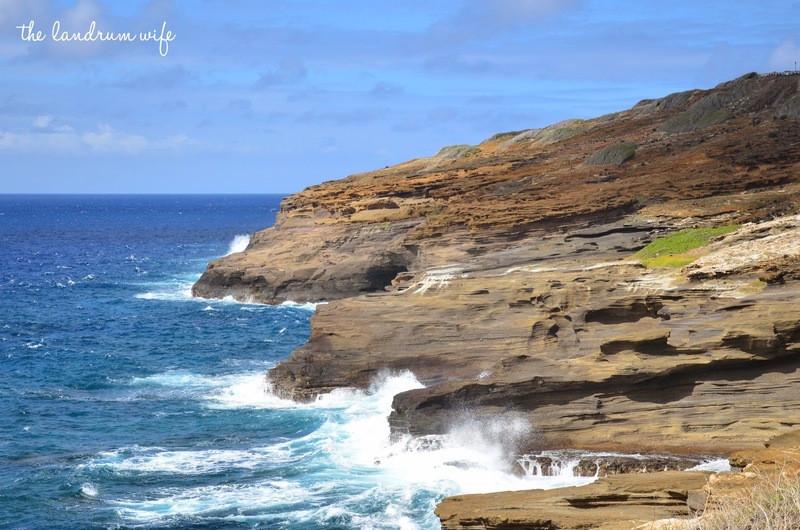 After roughly 2.5 miles from the Halona Blowhole, you will see a turn lane leading to a road (Makapu'u Lighthouse Rd) on your right that leads to a long, narrow parking lot; drive slightly past that road and you'll see a blue Scenic Point sign. Get in the turn lane, turn into the lot, and park. Makapu'u Overlook is a fabulous place to get a bird's eye view of some more of Oahu's coastline. Off in the distance are two islands that have been designated as bird sanctuaries and also Makapu'u Beach Park to the left. On a clear day, this is the spot to attempt to see Moloka'i. 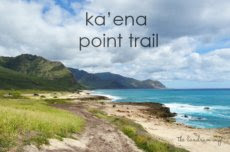 A very popular paved trail also begins from the first parking lot you passed called the Makapu'u Lighthouse Trail and just happens to be a great spot to view humpback whales in the wintertime. Like the other scenic overlooks, plan to stay about 5 to 10 minutes to soak in the views. 11. Pull out of the lot and take a right back onto Kalanianaole Hwy (Hwy 72). Continue for about 8.5 miles; the road will veer from the coast and travel inland. You'll pass through the town of Waimanalo (which actually has a beautiful beach at Waimanalo Beach Park) and eventually come to the intersection of Hwy 72 and Hwy 61 (Kailua Rd). 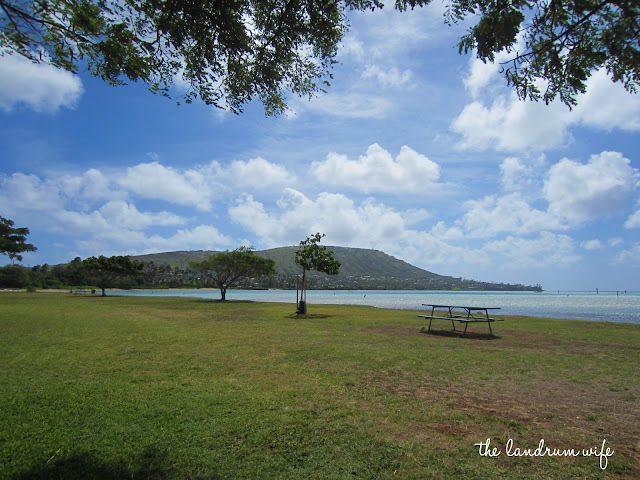 NOTE: Stop here in Kailua or up a little ways in Kaneohe for lunch if you didn’t bring a picnic with you. bet to grab some lunch. If you choose Kailua for lunch, turn right at Hwy 61 and follow it into Kailua proper. If you choose Kaneohe instead, take a left at Kalanianaole Hwy and Kailua Rd to stay on Kalanianaole Hwy/Hwy 72. Take Kalanianaole Hwy for approximately 2 miles until it meets with Kamehameha Hwy (Hwy 83); take a right onto Kamehameha Hwy and follow into Kaneohe. There are a few places in Kailua I either really like or have heard great things about. Teddy's Bigger Burgers is one I've tried -- it's a local chain (which I hear has actually branched out to the mainland now!) that has some pretty delicious burgers. I've only been to the Waikiki and Hawaii Kai locations, but if it's anything like those, you'll leave satisfied. And spring for the garlic fries, they are delicious! Lanikai Juice is another place I've tried that has really great smoothies with fresh, local, organic ingredients and other healthier alternatives to calorie-heavy fast foods. The Lanikai Splash smoothie is one of my favorites! Mr. L and I have also come to love Aloha Salads, a great little salad and sandwich place that is also local and organic and committed to supporting local farmers. 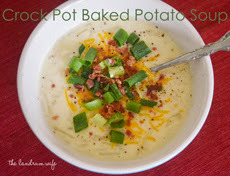 My favorite salad is the Caesar, and I'm completely in love with their bisque! Cinnamon's in Kailua is another stop that's actually really famous. I've only been there for breakfast, but I've heard wonderful things about their lunch. The red velvet pancakes really are as good as they say they are, and I also loved the eggs Benedict. The wait times are notoriously long, so be prepared if you show up during a popular time of day. Crepes No Ka 'Oi is also on my list to try -- it's a supposedly fantastic crepes place located in Kailua that claims to be "the original Hawaiian crepe company," serving both sweet and savory crepe-y deliciousness (check their contact page to make sure they're open before you go). I'll update this section soon after I've given these places a try. In Kaneohe, I have a couple of recommendations. First up is Dean's Drive Inn, which serves great authentic Hawaiian plate lunches, from ahi cakes to teri beef to loco moco. And if Hawaiian isn't up your alley at the time, Kaneohe's Boston Style Pizza's generous pizza slices and a variety of toppings may do the job. 13. Follow this road (Nu'uanu Pali Dr) for about 1 mile until you reach the Pali Lookout parking lot; pull in, park your car, and pay your fee at one of the parking machines. 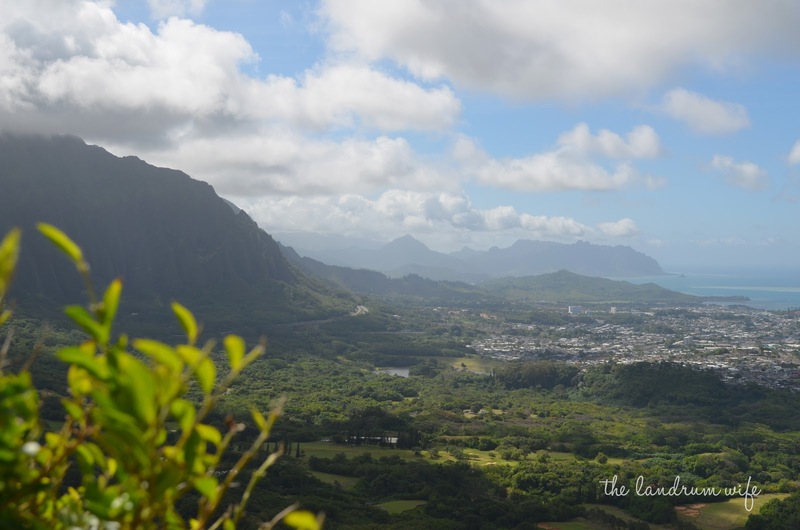 I've already talked about the Nu'uanu Pali Lookout before here on the blog, but here's some information just in case you need a refresher. 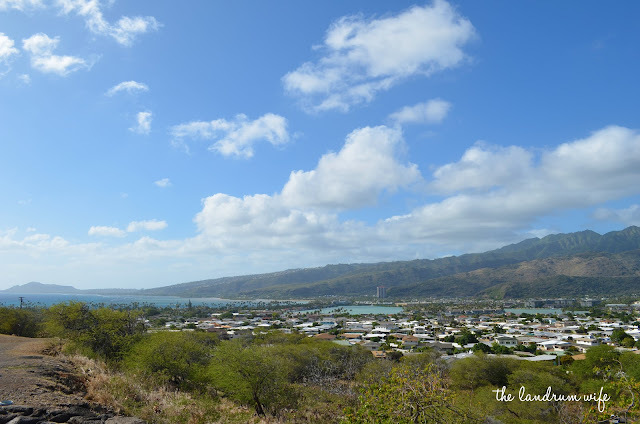 The Pali Lookout was historically the site of one of the bloodiest battles in ancient Hawaiian history, but thankfully now it's just a great place to get one heck of a view of the windward side of Oahu, from Chinaman's Hat to Kailua. Be sure to have a jacket on hand in case you get chilly -- it's VERY windy here! Also, here's a fun fact: the huge, windy interstate below you (the H-3) is one of the most expensive interstates ever built at $80 million a mile, or $1.3 billion total. Plan to spend approximately 15 minutes here (or longer to justify the $3 parking fee) to soak in the views. 14. From the Pali Lookout parking lot, take a left and follow Nu'uanu Pali Dr towards Kailua for about 0.2 miles; follow the road while it takes a sharp right turn back out onto the Pali Hwy (Hwy 61). 15. 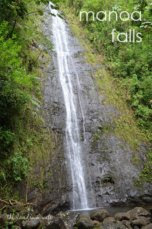 Stay on the Pali Hwy for approximately 2 miles until you once again reach Kamehameha Hwy (Hwy 83). Take a left here at Kam Hwy and drive for just shy of 1 mile until you reach the H-3, then get on the H-3 entrance ramp towards Honolulu. 16. Once you're on the H-3, (safely) peek at the gorgeous views of Kaneohe Bay through your rear view mirror as you climb higher and higher, particularly in the stretch before you enter the Tetsuo Harano Tunnel. If you're a passenger, turn around and look to your heart's content! After you enter the tunnel, follow the appropriate directions in order to get back to your home or hotel. Estimated tour time: 3-4 hours maybe (as soon as I'm able, I'll attempt this drive and update with a better estimation), depending on length and number of stops. The bare minimum amount of driving time with no stops is approximately an hour and a half. Just like before, if you have any additions, suggestions, or corrections (whether for the route itself or even restaurants along the way), leave a comment below and let me know! I'm always up for learning more about Oahu. Mahalo!